Since 2003, Trio Caliente's inimitable blend of Flamenco, Pop, and Brazilian Jazz has been enjoyed by political luminaries stateside and abroad; notable Fortune 500 companies; and venerated international organizations, festivals, and concert venues around the world. Whether providing elegant accompaniment to a formal dinner or sultry, throbbing rhythms that keep the dance floor packed all night long, Washington, DC-based Trio Caliente effortlessly creates the ideal atmosphere for any type of event. With vocals in Spanish, Portuguese, Catalan, and English set to a wide array of Latin grooves, Trio Caliente's sound is reminiscent of The Gipsy Kings, Buena Vista Social Club, Strunz & Farah, and Jobim� but with a fl avor all their own. 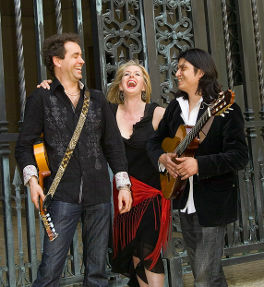 Trio Caliente's musicians have performed from coast to coast throughout the U.S. and in Spain, South America, Central America and the Middle East. From diplomatic tours with the U.S. Department of State to Inaugural balls, swearing-in ceremonies, and private events, Trio Caliente has collectively performed for such prominent fi gures as President Bill Clinton, Senators John Kerry and Bob Dole, Supreme Court Justice Sonia Sotomayor, Secretaries of State Henry Kissinger and Condoleezza Rice, and Federal Reserve Chairman Ben Bernanke. Sharing the stage throughout the years with Jazz legends like Charlie Byrd, Keter Betts, and McCoy Tyner to Salsa superstars Jerry Rivera and Luis Enrique, members of Trio Caliente have also performed and recorded with Grammy-nominated jazz fl autist, Nestor Torres, Latin Grammy-winner, Raul Jaurena, Shahin and Sepehr (Virgin/Higher Octave), and David Hidalgo of "Los Lobos." Corporate clients include: Microsoft Latin America, Target, The National Press Club, Federal Reserve Bank, League of Latin American Citizens (LULAC), The World Bank, Hispanic American Organization (HAO), Hotel Monaco, Clark Construction, NALEO Education Fund, The W Hotels, Capital One Bank, and many more. You've likely seen Trio Caliente appearing locally at Blues Alley, The Kennedy Center, Wolf Trap, The Harman Center, Strathmore, The Library of Congress, Mellon Auditorium,The D.A.R., and many other prestigious area venues.